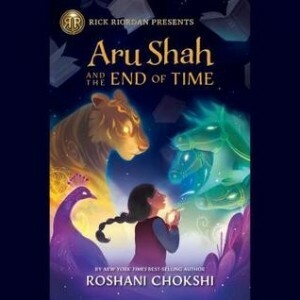 When you think of a superhero you don't exactly conjure up the image of 12 year old Aru Shah. Aru is struggling to feel like she belongs. There are all those kids at school who make her feel as though she isn't quite good enough. Her mother seems to spend all of her time working on her museum leaving Aru to find her own fun. Then the day comes when Aru just doesn't want to put up with the condescension and put downs any more. That's the day she's in her familiar place at the museum and to her shock, three kids from her school...three cool kids... are there too. This is her culture. This is her world...or at least it's her mother's world so you can well understand when she does it... she decides she's going to show those kids they don't know everything. She is going to show them that the Lamp of Bharata that they are unimpressed by is actually incredibly powerful. In a moment of anger and frustration Aru lights the lamp. That's when the world changes for Aru. That's when these three adversaries and her own mother are suddenly frozen in time. That's when the door opens wide to another world...a world where she is a Pandavi.... and she finds her sister, Mimi, a sister she has never known...and the two of them armed with who they truly are, their fears, and their hopes are going to have to figure out how to stop the Sleeper, a demon she has awakened. This is a hilarious, action-packed journey spiced with Hindu mythology. For those who loved Rick Riordan's series based in Greek, Roman and Norse mythologies, here is a new exotic world of adventure to explore. The characters could be you and your best friend. How will you fight these incredible powers? What powers will you discover in yourself along the way? Funny, exotic, and balancing two fascinating worlds to explore: your own powers and the wonder of the grand mythology of India. Add the unusual guide who has been summoned to accompany you through this world of gods and goddesses and a journey filled with surprises awaits.